I had to write a string reverse function today and wasn't happy with my initial (basic) function so I posted it on Stack Overflow to see what other algorithms that developers might come up with. My restriction was that it had to be in C# 2.0 and so I couldn't use LINQ. Out of curiosity I decided to do a performance test on each of the functions and while I was at it I threw in the LINQ equivalent to see how it would perform. For the test of a 500 character string I looped each function 100,000 times and for the test of a 10 character string I looped the functions 10,000,000 times. 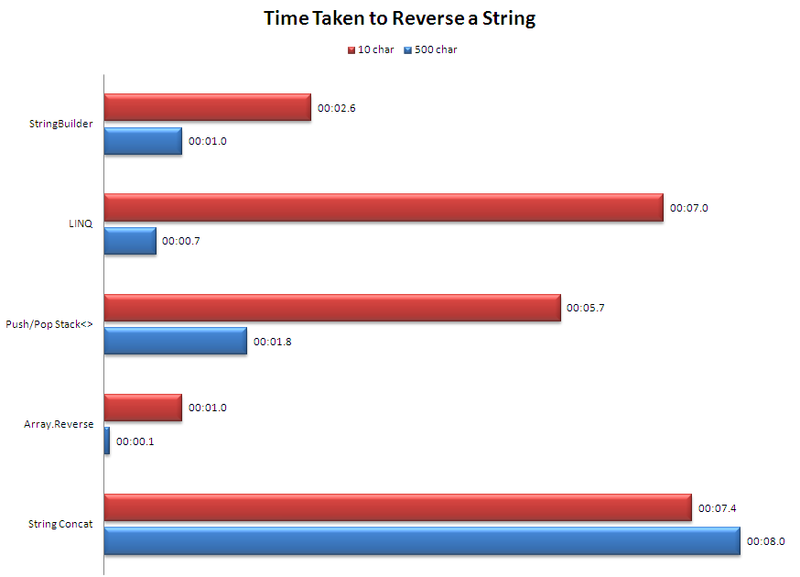 What surprised me was how poorley LINQ did on the short string compared to the others. @anonymous on 7 Feb: I believe that's what the Array.Reverse(charArray); function does internally. //assuming string length is > 0 :-). A friend just made comments (different org via email) to me regarding the LINQ performance, and it prompted me to come back a review more carefully; more specifically, to see how you had used LINQ with this problem. So 'politely', I'd say that the extension method used in your example is not LINQ. It's an extension of IEnumerable. LINQ does not really lend itself to this problem (I think). While I'd expect an 'array' specific extension method to be fast at reversing an array; I would expect it to grab a memory block and populate by reverse index traversal of the original array. However, the Reverse method used is an extension of IEnumerable. Therefore, it has no knowledge of the length of items and will need to fully traverse the items before it can reverse them. All that said, and while I recognise that you have to first create the array in your example/ approach, I also note that you have a superfluous statement i.e ToArray. What I'd guess IEnumerbale<T>.Reverse() looks like (I have not decompiled this). // Sorry, I'm using notepad on a non dev machine and this may have minor errors. Dragged in :-( (now I'm paying for it :-)). "The most common extension methods are the LINQ standard query operators ........ "